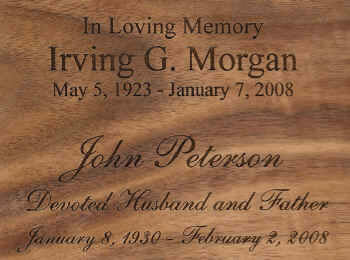 The Menorah on Walnut Wood Cremation Urn has a lit menorah of inlaid wood on a background of beautiful walnut. The Menorah symbolizes the nation of Israel but is also symbol for light, wisdom, and Divine inspiration This is a beautiful urn for anyone of the Jewish faith. The urn is easily accessed through a bottom plate which attaches with screws.